I love cables. I am obsessed with lace. Cables and lace are my idea of a knitting nirvana. In Nyssa, I combined a few simple cables with some basic lace stitches for an interesting mix of textures. I was inspired by nature in autumn, with its deep, rich colors and an incredible variety of textures. 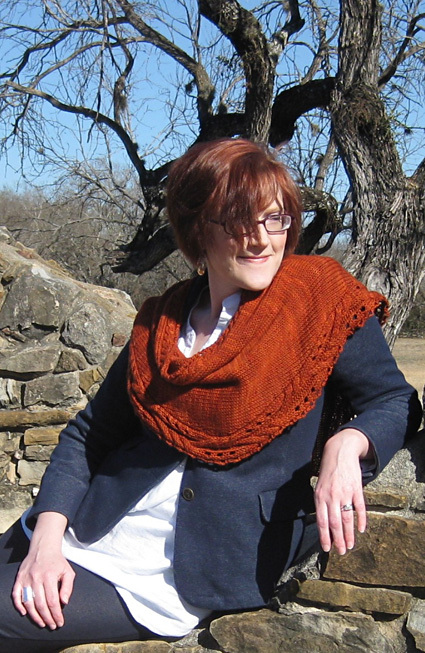 The shawl's name, Nyssa, comes from the genus designation of the tupelo tree known for its amazing fall colors. Worked in a worsted weight yarn, the shawl is knitted in one piece, side-to-side, using just under 440 yards of this beautiful Spirit Trail Fiberworks cashmere yarn. 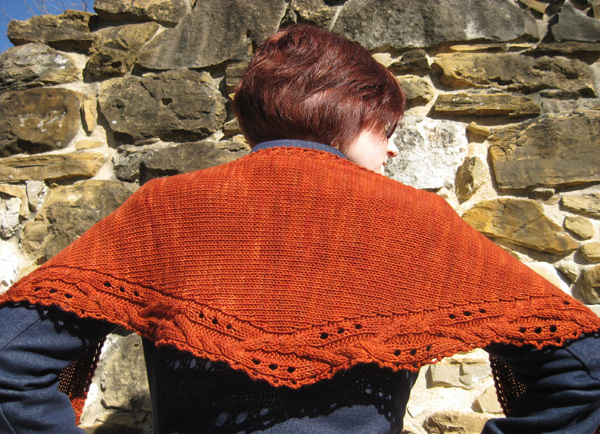 Verdande has a wonderful stitch definition, perfect for making the most of Nyssa's cables and textured stitches. Elegant and practical, the shawl can be worn loosely like a long scarf, it can be draped around the shoulders as a traditional shawl, or it can be wrapped closer around the neck for extra warmth like a neckwarmer. 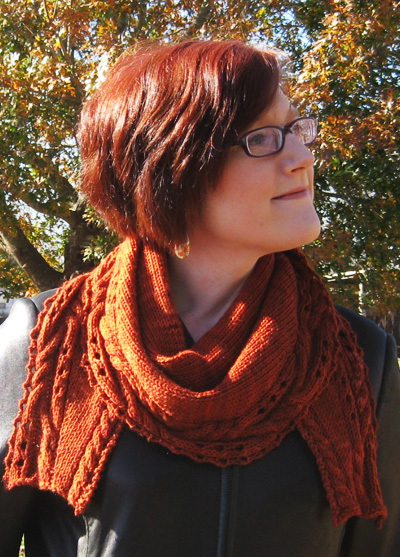 Nyssa is a quick and fun project, perfect for gift knitting; it will add a brilliant touch of color to any wardrobe. C4L: Slip 2 sts to cable needle and hold to front of work; k2 from left needle; k2 from cable needle. C6L: Slip 3 sts to cable needle and hold to front of work; k3 from left needle; k3 from cable needle. C6R: Slip 3 sts to cable needle and hold to back of work; k3 from left needle; k3 from cable needle. T6L: Slip 3 sts to cable needle and hold to front of work; p3 from left needle; k3 from cable needle. T6R: Slip 3 sts to cable needle and hold to back of work; k3 from left needle; p3 from cable needle. Setup row [WS]: K15, pm, k2, pm, k8. Row 1 [RS]: Work Chart 1 to first marker, k to next marker, m1, slip marker, work Chart 2 to end of row. 1 st increased in stockinette section. Row 2 [WS]: Work Chart 2 to first marker, p to next marker, work Chart 1 to end of row. Row 3 [RS]: Work Chart 1 to first marker, k to next marker, work Chart 2 to end of row. Row 4 [WS]: Work Chart 2 to first marker, p to next marker, work Chart 1 to end of row. Repeat Rows 1-4 until you've worked 5 full repeats of Chart 2, and another 8 rows of the chart. 44 sts in stockinette section. Next Row [RS]: Work Chart 1 to first marker, k to next marker, work Chart 2 to end of row. Next Row [WS]: Work Chart 2 to first marker, p to next marker, work Chart 1 to end of row. Row 10 of Chart 2 is complete. Row 1 [RS]: Work Chart 1 to first marker, k to 2 sts before next marker, ssk, work Chart 2 to end of row. 1 st decreased in stockinette section. 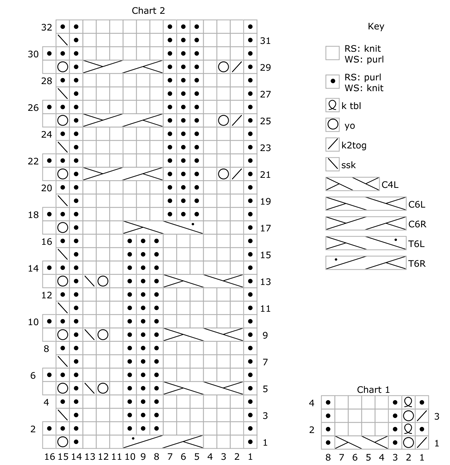 Repeat Rows 1-4 until you finish the current repeat of Chart 2, and work 4 more full repeats, then work Rows 1-17 again. 2 sts in stockinette section. Knit next WS row, removing markers as you go. Weave in all loose ends. Block piece to measurements, pinning out the lace points along the edge. When completely dry, remove pins and trim all yarn tails. 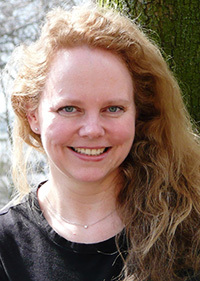 After nine years in Europe, Susanna IC now lives in San Antonio with her husband, two sons, one guinea pig and countless balls of yarn. Besides a background in fashion design, she has a Master's degree in art history and a Bachelor's in studio arts, all of which continue to inspire her knitting. Her projects and designs can be found on Ravelry, and at ArtQualia.com.